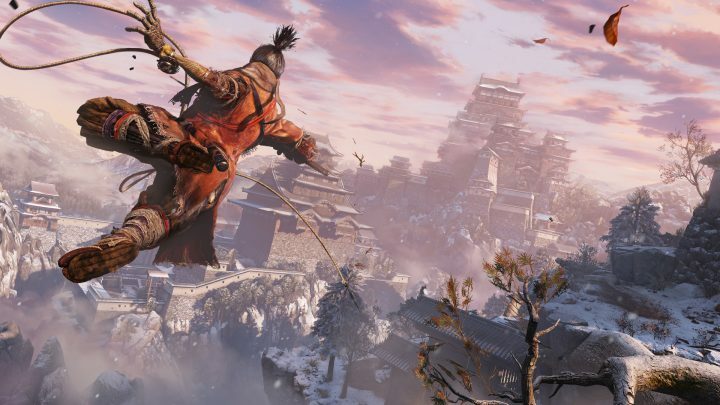 Prayer Beads are al key item in Sekiro: Shadows Die Twice that will increases your maximum vitality. Collect four prayer beads, and they’ll combine into a Prayer Necklace. Turn the necklace in at an Idol and you’ll gain a permanent health upgrade. There are 40 Prayer Beads total, which equals 10 Prayer Necklaces — if you manage to turn them all in, you’ll be able to upgrade Sekiro’s health by a hefty 200%. Most Prayer Beads are dropped by mini-bosses, but certain beads can be found in the world. Some of them can even be purchased. Here, I’m not going to explain how to beat every single boss, but I will detail how to find the bosses, and how to find the hidden beads you might miss. It’s worth noting that Prayer Beads are a one-time-use item. If you pick them up on your first playthrough, they won’t appear in New Game+. Unlike other Soulsborne games, you can only unlock permanent enhancements with items. Once you use the Prayer Beads once, you’ll find different items replacing them in future playthroughs. Some Prayer Beads are available to collect in the environment, but most are dropped by defeating mini-bosses. Here, I’ll break down where every bead is found in each area of the map. 3 Prayer Beads: Three are dropped by mini-bosses that you cannot miss. General Kawarada, Chained Ogre, and General Yamauchi all drop Prayer Beads. 1 Prayer Bead: Found in the temple, in the large battlefield outside the main gates of Ashina Castle where you fight the boss Oniwa. Enter the temple, grapple up and climb into the highest room. You’ll find Tengu of Ashina inside on your first visit. 2 Prayer Beads: Dropped by mini-bosses in Hirata Estate, in its first state. Dropped by the Shinobi Hunter (Bamboo Thicket Slope) and Juzou the Drunkard (Main Hall Courtyard). 1 Prayer Bead: There’s a hidden prayer bead behind a secret wall in the Hirata Audience Chamber area. The hidden wall is marked by a scroll down the passage. 5 Prayer Beads: Dropped by mini-bosses in the Ashina Castle area in its first state. Dropped by Blazing Bull (Entrance Path), General Matsumoto (Just outside the tower), Seven Ashina Spears – Yamauchi (Ashina Reservoir), Ashina Elite – Jinusuke Kaze (Ashina Dojo), and Lone Shadow Longswordsman (Ashina Reservoir Well). 3 Prayer Beads: Dropped by mini-bosses that appear in Ashina Castle in the evening, during its second state when Shinobi attack. Dropped by Lone Shadow Masanaga (Great Serpent Shrine), Chained Ogre (Upper Tower), Lone Shadow Vilehand (Ashina Dojo). 1 Prayer Bead: Behind a hidden wall in the Upper Tower – Antechamber area. Go to the room with two armor suits — the hidden wall is between the two suits. Go through the hidden wall to find a chest with this bead. 1 Prayer Bead: Sold by Memorial Mob outside the dungeon entrance. Costs 1400 sen.
2 Prayer Beads: Dropped by mini-bosses in Senpou Temple. Dropped by Armored Warrior and Long-Arm Centipede Sen-Un. 1 Prayer Bead: Found underwater, in the pond near the Under-Shrine Valley Idol. Acquire Mibu Breathing Technique to swim down and collect it. 2 Prayer Beads: Dropped by mini-bosses in the Sunken Valley area. You can’t miss them. Dropped by Snake Eyes Shirafuji, and Long-arm Centipede Giraffe. 1 Prayer Bead: From the Under-Shrine Valley Idol, find the nearby tree grapple-point and climb the wall by the two gunners. Shimmy across the ledge and follow the path to an optional area with a Prayer Bead. 1 Prayer Bead: In the room where you defeated Long-arm Centipede Giraffe, drop through the hole in the floor and explore the deep caverns. Follow the grapple points right to a chamber guarded by multiple centipede ninjas and poison geckos. 3 Prayer Beads: Three Prayer Beads are dropped by mini-bosses in the Ashina Depths region. Dropped by Snake Eyes Shirahagi (Poison Pools), Tokujiro the Glutton (Hidden Forest), O’Rin of the Water (Mibu Village). 2 Prayer Beads: Dropped by the Headless ape in the cavern just before the Hidden Forest idol. The Headless Ape will spawn after you defeat the Guardian Ape boss. 1 Prayer Bead: Before dropping into the Guardian Ape arena, look for a tree grapple point to the left. Take the path up and past the wall-jumps to a statue — you’ll find a Prayer Bead on the statue itself. 1 Prayer Bead: Near O’Rin of the Water’s mini-boss arena, enter the old temple and reach the second floor. The Prayer Bead is in this attic. 1 Prayer Bead: Acquire the Mibu Breathing Technique from the Corrupted Monk boss, then swim under the lake in the center of Mibu Village. 2 Prayer Beads: Dropped by mini-bosses in the palace area. One is dropped by Sakura, Bull of the Palace — outside the courtyard guarded by strange nobles. The other is dropped by Okami Leader Shizu, the archer that shoots bolts of lightning if you attempt to swim in the water. 1 Prayer Bea: Found in the waters with the Headless, where the giant carp appears. The bead is underwater, near the giant skeleton. The areas listed here are only available after completing Fountainhead Palace and entering the endgame. 2 Prayer Beads: During the main ending path, you’ll return to Ashina Castle when it is under attack. The Prayer Beads are dropped by Seven Ashina Spears – Oniwa (path to the final boss), and Ashina Elite – Mizou (room under Isshin Ashina’s chamber). 1 Prayer Bead: During the main ending path, you’ll return to Ashina Castle when it is under attack. This is dropped by Shigekichi of the Red Guard in Ashina Outskirts, on the path to the Demon of Hatred boss. 2 Prayer Beads: On the [Purification] Ending path, which is initiated by listening in to main character conversations in all Important areas, you can enter the second instance of Hirata Estate. Two new mini-bosses will appear. Dropped by Lone Shadow Masanaga (The Owl’s burning courtyard) and Juzou The Drunkard (Main Hall Courtyard).